Being there vs. not being there. It seems like a simple enough distinction, and one intrinsic to performance and participatory art. Yet theorists such as Amelia Jones and Philip Auslander have blurred this boundary, arguing influentially that performance art has many lives through which it can be experienced, circulating as it does through scripts, anecdotes, photographs and films, proliferating across media. Many artists, meanwhile, have used performance to question the veracity of any individual viewpoint, even of the most enduring audience members. Marina Abramović’s 512 Hours at the Serpentine Gallery is one of the performances that I have managed to be there for. On entering the space, I was led to a chair and directed to have a conversation with the person next to me: unsurprisingly, one of the first points we found in common was that we had both watched Abramović’s 2012 film The Artist is Present, which follows the course of her eponymous show at the Museum of Modern Art in New York in 2010. Even though this time we were physically present, that presence was informed by a combination of documentation, canny marketing and the celebrity cultivated by Abramović, as much as any desire for immediacy. The rhetoric surrounding the show has belaboured emptiness and absence. 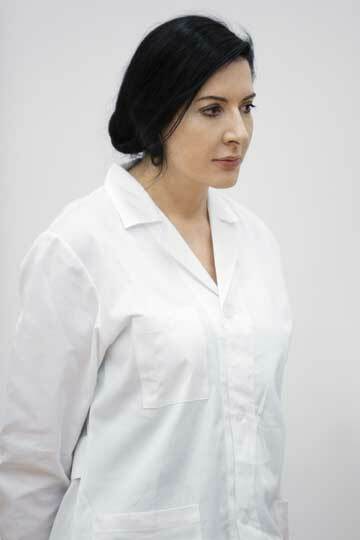 Some reviewers, meanwhile, have found the apparent docility of Abramović’s participants – many of whom sit or stand with their eyes shut, meditating, for substantial periods of time – distinctly troubling. I was more immediately perturbed by the discreet security cameras peeking down from the corners of each room, coupled with notices informing visitors that by being in the space they agreed to be filmed for documentation. It was difficult to repress the suspicion that some people had anticipated this and dressed accordingly (and the vain wish that I also had). But even the most beautifully attired in the Serpentine Gallery had a hard time vying with Abramović’s irresistible magnetism. Her movements were accompanied by a distinct uptick in noise and energy when she entered a room, and a positive hum filled the air when she chose a particular person to walk and talk with. At one point, despite the ministrations of various assistants, one room remained stubbornly empty, while a crowd scrummed around Abramović next door. The parts of the exhibition that came closest to fulfilling Abramović’s brief were the ones from which the artist herself was noticeably absent. As Maggie Gray has noted on this blog, ‘it would be far more radical, at the height of her fame, for Abramović to stage an exhibition in which the artist isn’t present.’ Equally, it could be fascinating if Abramović were to question the cult of celebrity that has grown up around her, rather than tending it, and address the role of the policing gaze in the construction of such a piece – whether from film cameras, between audience members, or internalised by individuals anticipating potential viewers of films and photographs. It is ironic that while Abramović stands accused of neglecting historical precedents for her use of ‘nothing’ in the work, the piece itself is explicitly aware of its own futurity, in the process of being fully archived for a place in history. Even if you don’t make it to Hyde Park, you’ll probably be able to buy the DVD. Again, reflection on this could have been both intriguing and vital – as in Clifford Owens’s Anthology project (recently presented at Manchester’s Cornerhouse Gallery) – while allowing Abramović to acknowledge the many precedents for her particular brand of Nothing. ‘Marina Abramović: 512 Hours’ is at the Serpentine Gallery until 25 August. Do you have to visit Abramović in London in order to understand her latest work? This seems to be a case of the Emperor’s New Clothes. We entered with open minds, but fail to see the presence of art in this self regarding ‘exhibition’. Interestingly the demographic of those engaged was considerably younger than those of us a little older, perhaps more cynical, who were perplexed. If it had been billed as a space for tranquility, and contemplation, that would have been more understandable. As it was, we failed to see the artistic point and remain unconvinced by the merits of such an effort. But it did provoke a debate!